Hello and happy Friday!! 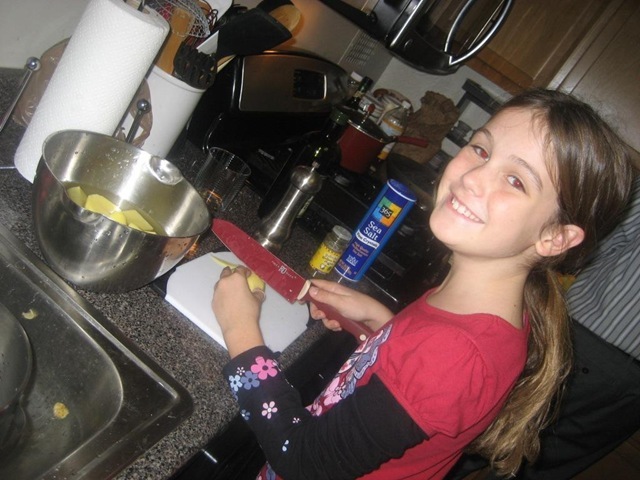 Kids in the Kitchen is a new series I’ll be doing on my blog every Friday, because every Thursday night Wil and I will be doing a kids cooking lesson with his daughter, Charlotte, and her sister Nora. 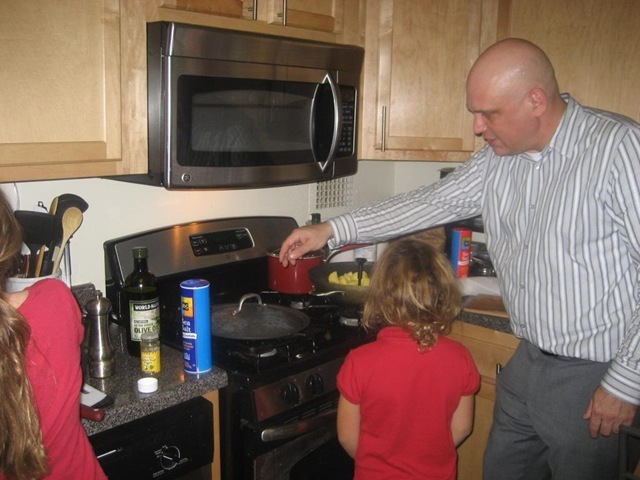 They are super fun to be around and are very excited about learning how to cook and helping make dinner every week. We’re letting them pick out the food they want to make the week before so that when they come over on Thursdays we can get right into the kitchen! 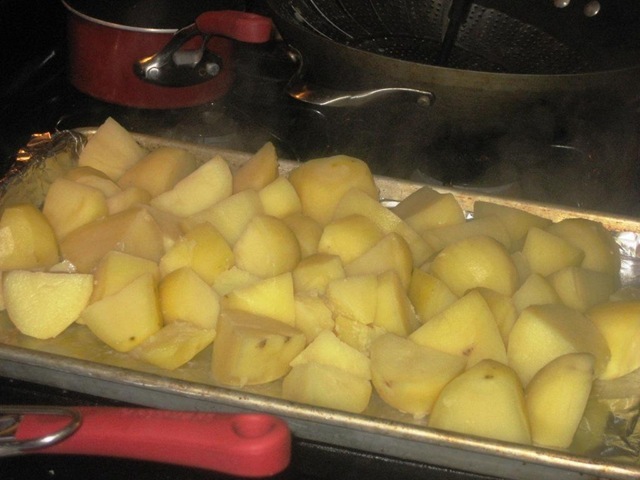 And then it was back in the kitchen to learn about a restaurant secret for mashed potatoes… After the potatoes are steamed/boiled, you put them in the oven to dry them out. 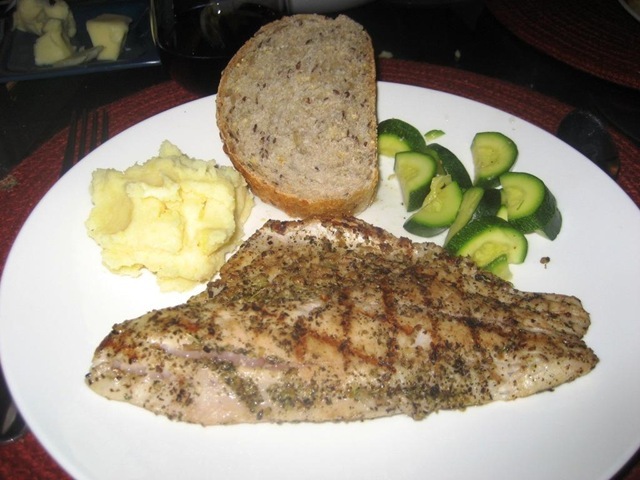 I ate about half of that huge hunk of fish and way more zucchini… so good! 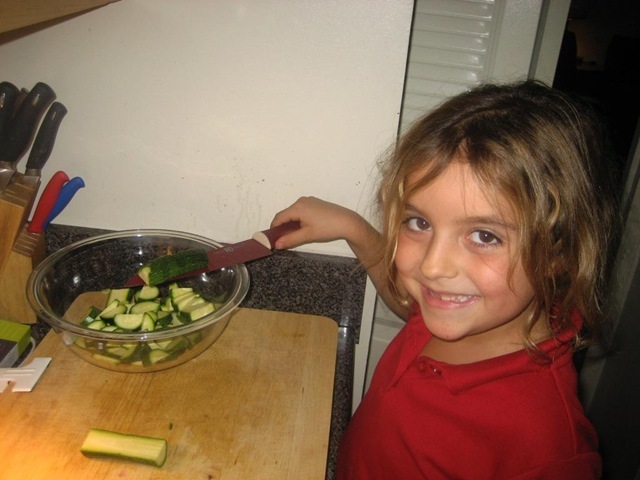 I think its such a fun thing to have your kids get involved with cooking and planning the meals. I’m looking forward to teaching them about healthy eating and not making meat the center of your meal (clearly not demonstrated last night!). Next week we are doing homemade pasta with veggies and salmon! And the winner of the Adora Giveaway is Nimyah, who said “Ok, I was having this discussion with a friend the other day of which I preferred. Without a doubt it has to be Milk Chocolate. Dark Chocolate just seems too rich, however is great for baking. 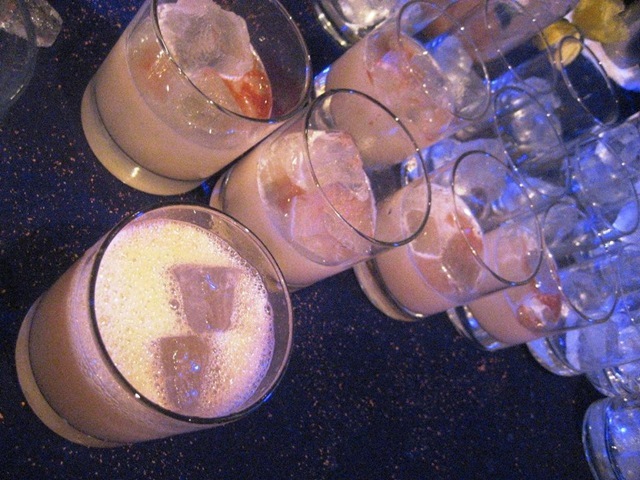 With the Milk Chocolate, I would have to make some smores smoothies! adding Peanut Butter will just be an added treat.” Congrats!! Please email me your shipping information to bethklein at gmail dot com. If you have kids, do they help you in the kitchen at all or with meal planning? 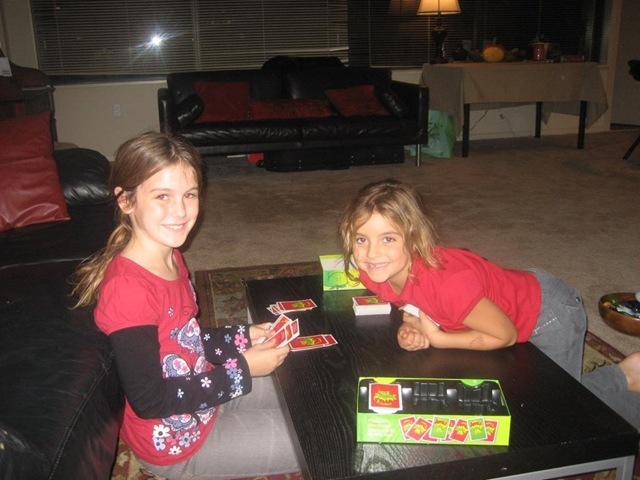 If you don’t yet have kids but plan to, do you see yourself having them involved? 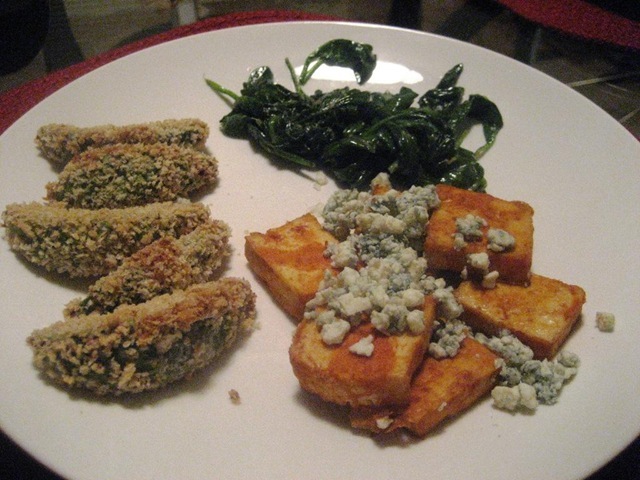 After the gym, I made an awesome meal – Buffalo Tofu with Avocado Fries. 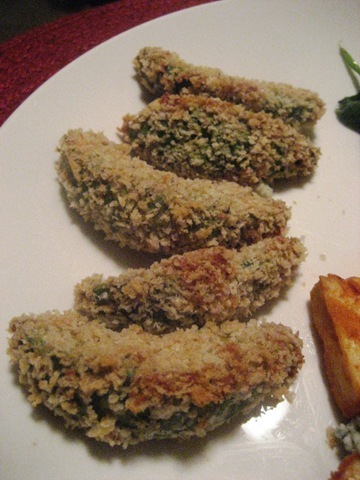 Last week, my friend Emily sent me a recipe for avocado fries, and I knew I had to have them. I healthified the recipe, and it turned out so good. 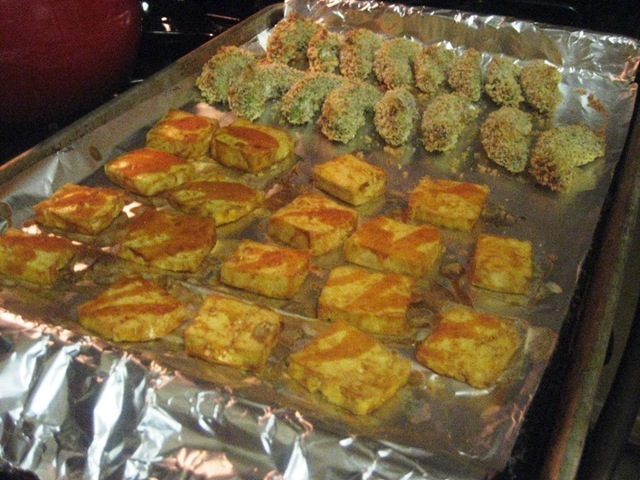 I was also craving buffalo tofu which seemed like the perfect thing to go with creamy avocado fries. Cut the tofu into your desired shape, and douse it with frank’s red hot. Let it marinate while you prep the fries. 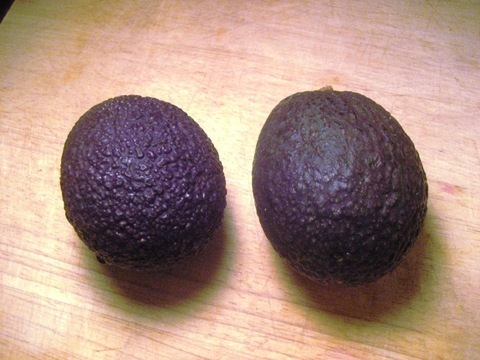 Take two avocados that are semi firm (NOT soft) so they retain their shape. 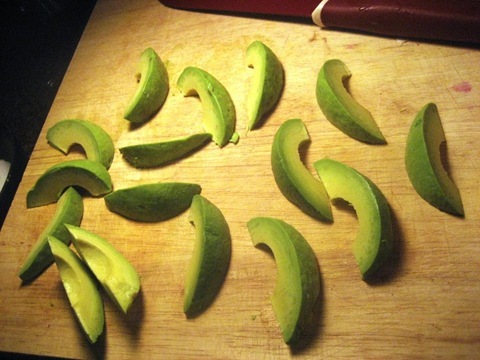 Cut each avocado in half, carefully remove the skin, and cut each half into quarters. Get three bowls. 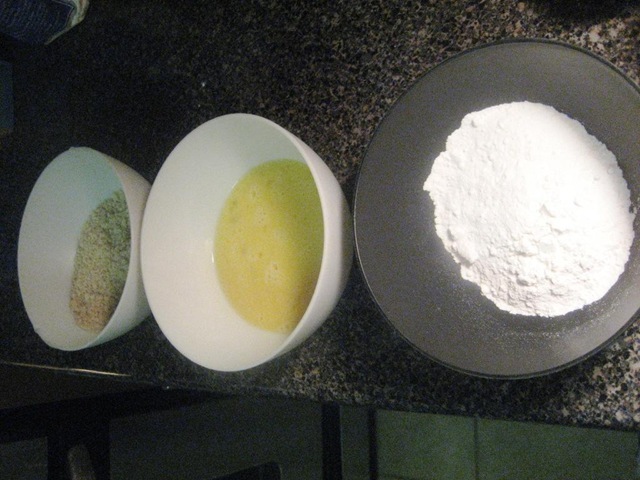 To the first, add the flour. 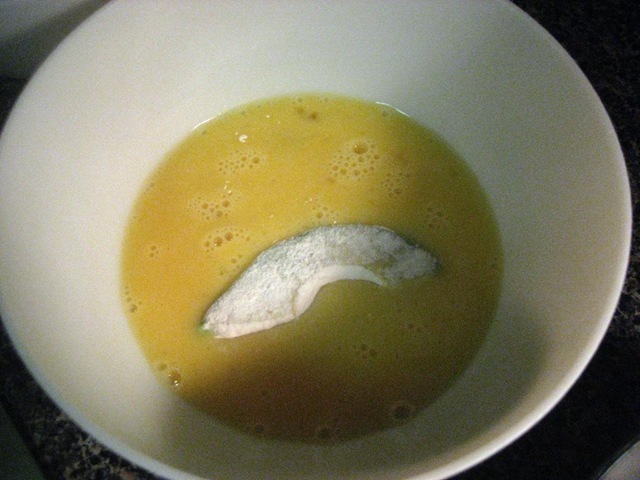 To the second, add the two eggs and beat them until smooth. To the third, add panko and salt and pepper and mix it up. 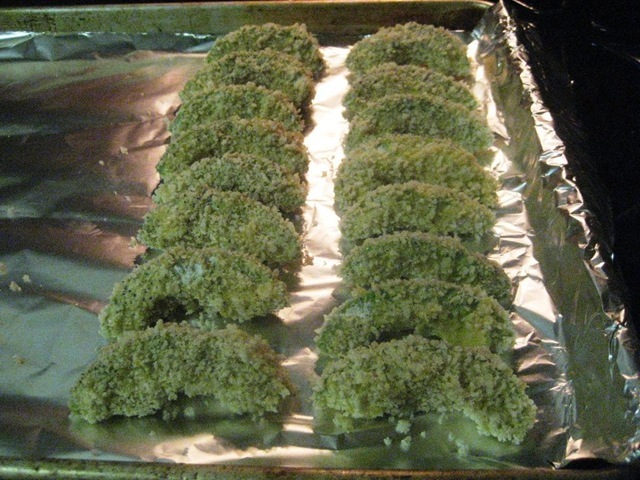 Take each piece of avocado and place it first in the flour, then in the egg, then in the panko. Repeat process until each piece of avocado is covered in all three. 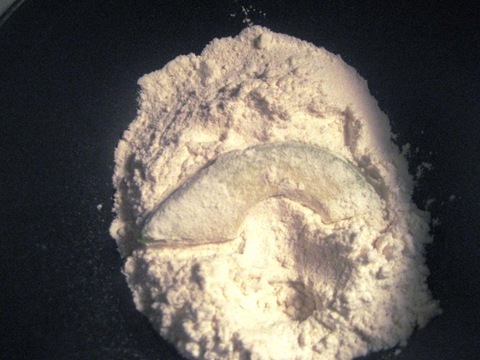 It’s best to use one hand only in the egg, so use your right hand to put it in the flour and move it around, then your right hand to drop it into the egg. Then use your left hand to mix it around in the egg and drop it in the panko, then your right hand to mix it up in the panko and transfer it to the baking sheet. Think wet/dry hand and it’ll keep the process less messy. 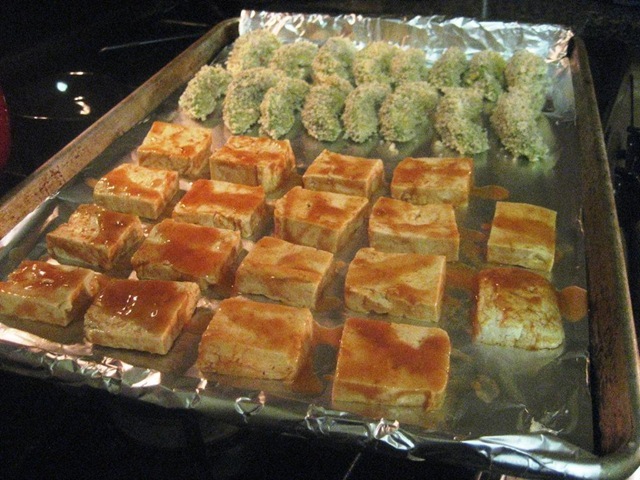 Once all your fries are prepped, transfer the marinated tofu to the same baking sheet. Place baking sheet in preheated oven for 20 minutes, flip everything over, and bake for another 20 minutes. 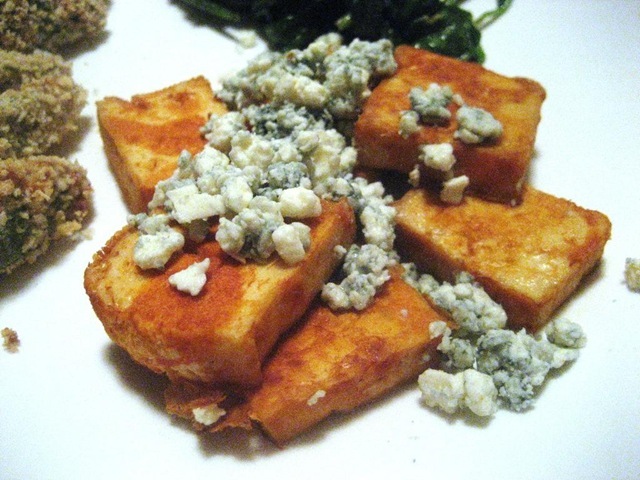 Garnish the tofu with extra frank’s red hot (if you want) and blue cheese crumbles. 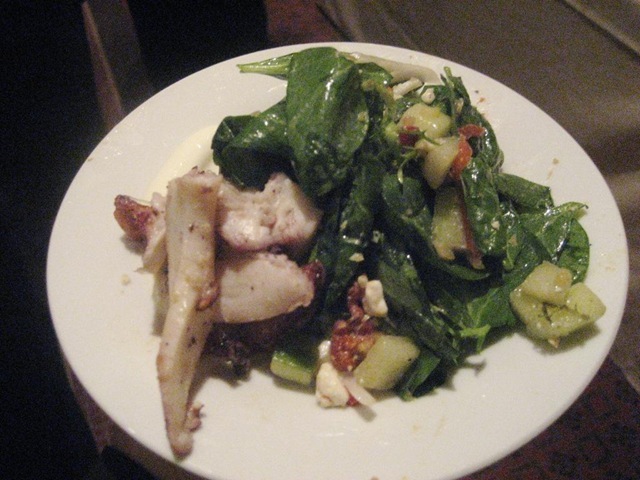 I also added some sauteed spinach for good measure to round out the plate. This dinner was AWESOME. The avocado gets a little melty and warm and the panko stays really crispy so the texture of the fries is awesome. The baked tofu was great too because the buffalo sauce really stuck to the tofu and it was perfect with the blue cheese crumbles. Also, when you make buffalo style anything at home, its automatically way healthier than when you order it out, because typical buffalo sauce is hot sauce plus a stick of butter. This had no butter and still was super flavorful and delicious. SO good. I am very excited for leftovers today for lunch!! What is your strength training routine like? How often do you lift weights? Remember – today is the last day to enter the Adora giveaway! Glad you all enjoyed the recap of last night’s event – it was SUCH an amazing time and for such a great cause, too. I am looking into ways to get more involved with March of Dimes because I was so touched by the event last night – I’ll keep you posted on that! I had no idea what I wanted for breakfast today, so I just threw a bunch of random things in a bowl and called it a meal. A breakfast mess, if you will. Adding the mashed banana to the mix was an awesome idea – it made it so sweet and gave the bowl an awesome texture against the crunch of the granola. The other best part was it took 2 minutes total to throw this together. Check and check. 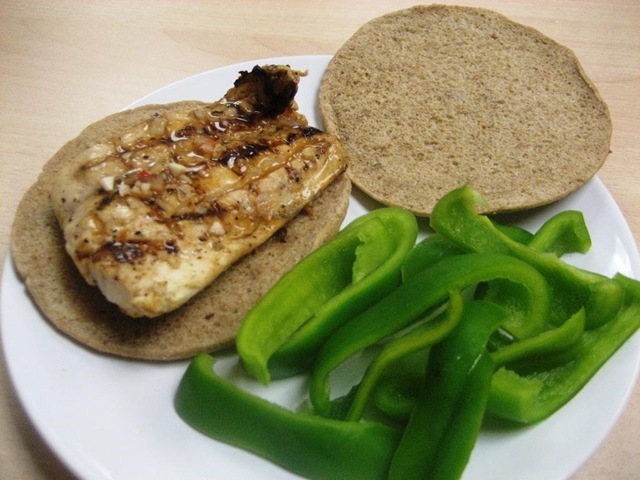 Lunch was the last leftover piece of grilled rockfish (caught on Monday!) on a very lame sandwich. 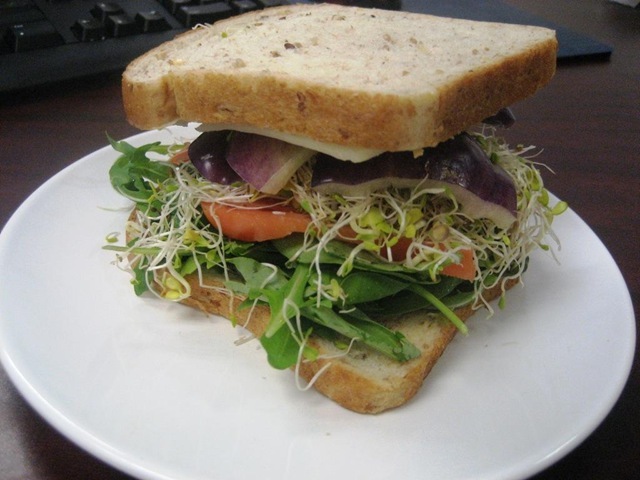 I had sprouts and greens in my fridge but totally forgot to bring them so the sandwich couldn’t have been more plain. Luckily the fish was out of this world fresh and it was marinated in that awesome “dressing” of red chili paste, olive oil, shallots, garlic, citrus, salt and pepper. I was looking everywhere for info on those new arnold sandwich things I spotted and bought and couldn’t find any info, so I snapped a photo of the package this morning. They have the same nutritional stats as the original ones (1 pt on WW) but these ones have flax seeds on the outside of the roll so that is semi-exciting. 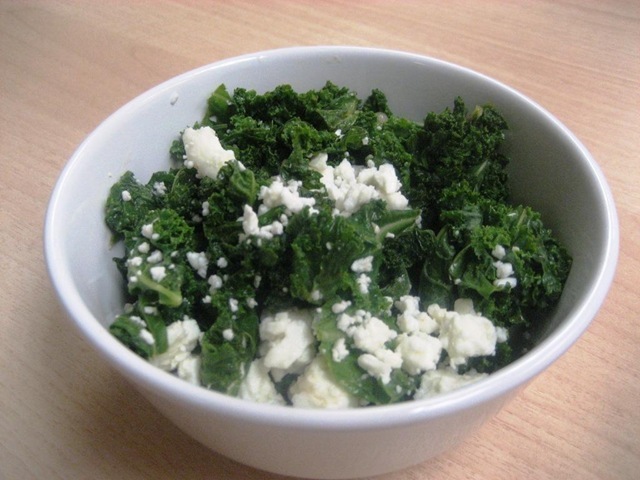 Along with the sandwich and sliced bell pepper, I had a kale salad with more of that dressing that the fish was marinated in, plus some feta. So, one of my goals for this week is to work on Meal Planning, something I am traditionally very bad at. I did a little online research and found a TON of great tools for meal planning, so I wanted to share a few of them with you. There are lots of ways to do meal planning – in your head, on paper, on a chalkboard, in a word document, excel spreadsheet, etc. I first found these cute little planners with space to plan breakfast, lunch, and dinner for the weeks that you can print out. You can find it here. This one is cool because its super simple, free, and has space for all three meals. I do wish there was a little room for snacks though but I guess I don’t need to plan those as much. After I printed that out, I found an even cooler thing for meal planning in excel. Basically, this is a weekly planner that allows you to do breakfast, lunch, and dinner, but also snacks. The main page of the spreadsheet has drop down menus with all your pre-loaded options for breakfast lunch and dinner. The other pages on the spreadsheet are where you can customize and add a list of your go-to meals. It is pretty intense, but I feel like once you got it set up with a lot of your meals, especially if you tend to repeat meals a lot, it can be an extremely useful tool. 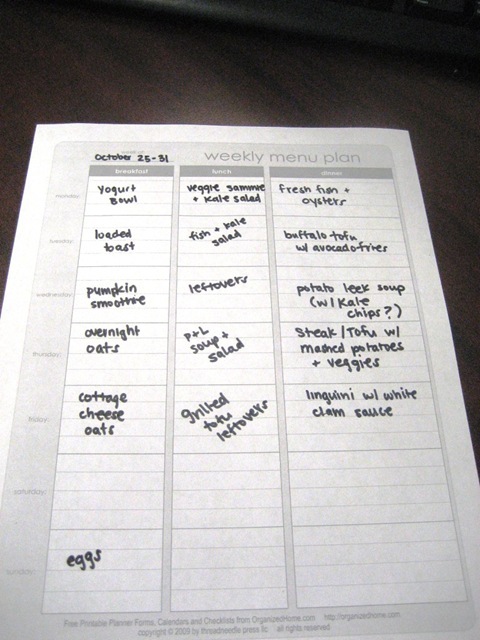 You can download that spreadsheet here and its called the Weekly Meal Planner. I thought those were two pretty cool things that I honestly didn’t even know existed before yesterday. I plan to do another post a little later in the week with tips and tricks specifically for meal planning, so please share comments on this post with your experiences. Are you a meal planner? How do you plan out your meals? Which ones do you plan? Do you find it helps you save money/trips to the grocery store? Any tips/tricks you can suggest? 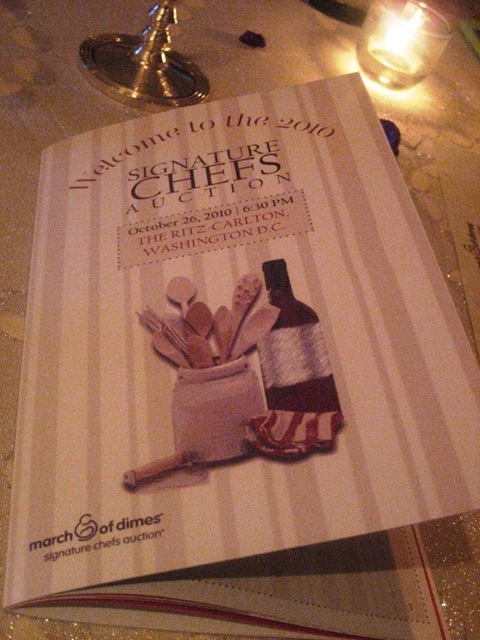 The March of Dimes Signature Chefs Auction of DC last was SO fun. The event has more than 30 of DC’s top chefs and bartenders for a night filled with tons of great food and drinks and I got to cover it on behalf of Foodbuzz through their Foodie Correspondent Program. 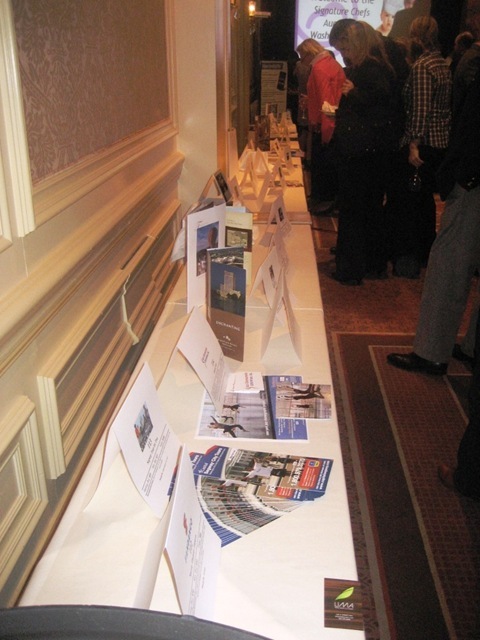 The evening was divided into three parts – first a VIP reception, then a silent auction, then a live auction. I went to the VIP reception but just for a second because there were a lot of people in a very small space and everyone there seemed to know each other and I knew no one. So I headed over to the Ritz-Carlton where the main event was being held shortly thereafter to check in. 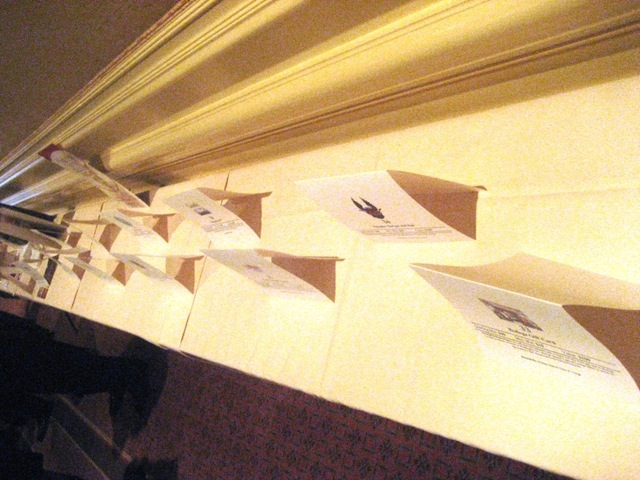 The silent auction was set up during the tasting portion of the event, lasting just under 2 hours. 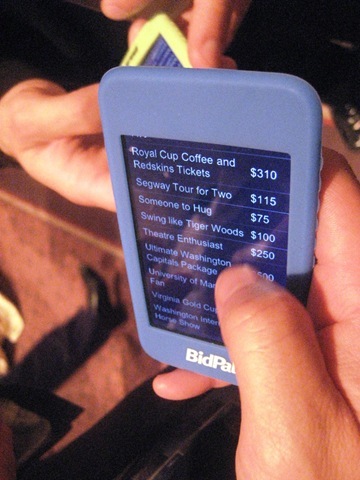 Every attendee was given a BidPal to use, which is similar to an ipod and allows people to bid electronically and keep updated ont eh status of their bids. It was SO cool! Lining almost the entire tasting room were were tent cards displayed with the items up for bid during the silent auction. I was kind of glad to not be given a BidPal because that could have been dangerous. All of the items were sorted by category and you received instant notification if someone outbid you, so I imagine they raised a lot more money than they would have with a paper auction. 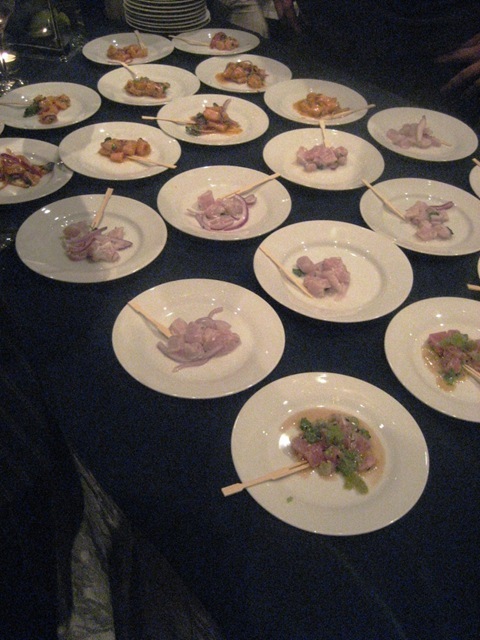 Inside the room, there were tables and tables of food and drink tastings from some of the areas top restaurants. 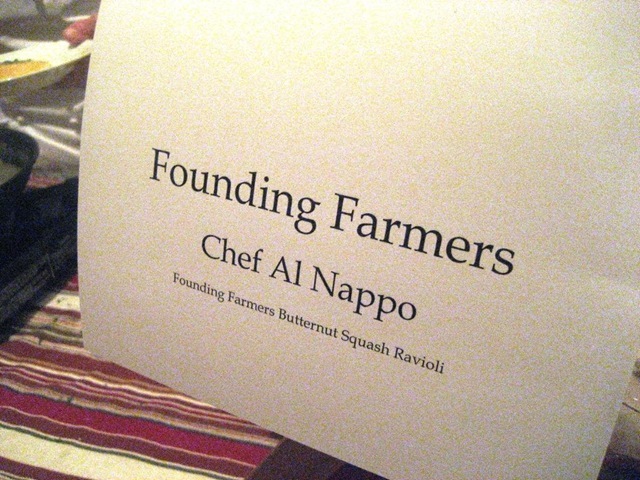 My favorite tasting from the whole evening came from Founding Farmers. I tried to look away when he put a huge hunk of butter into the pan for the sauce, but glancing at the plate you can’t really deny that. 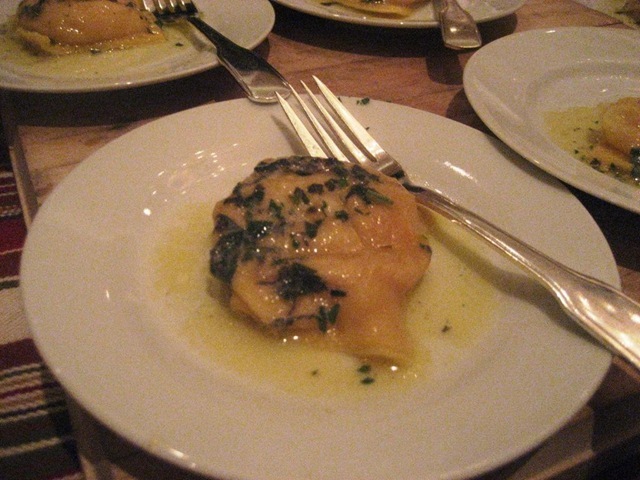 The ravioli was stuffed with butternut squash and literally melted in my mouth. I went back at least one more time for another one of these. Heaven. 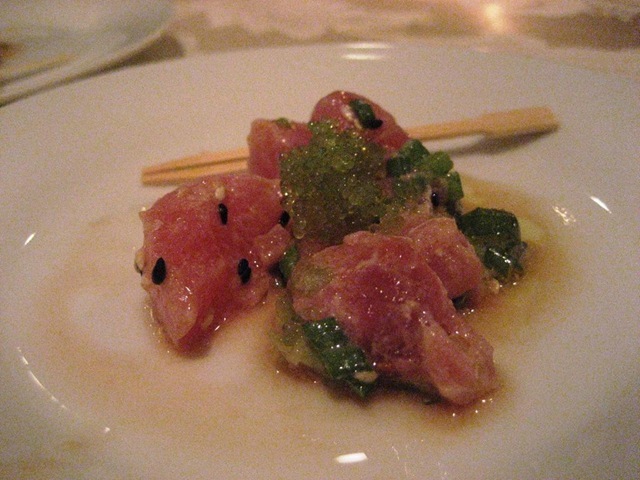 I was actually sort of surprised with the number of tastings that were vegetarian/pescatarian friendly. I assumed I would only be able to eat a few things, but that was not the case at all. 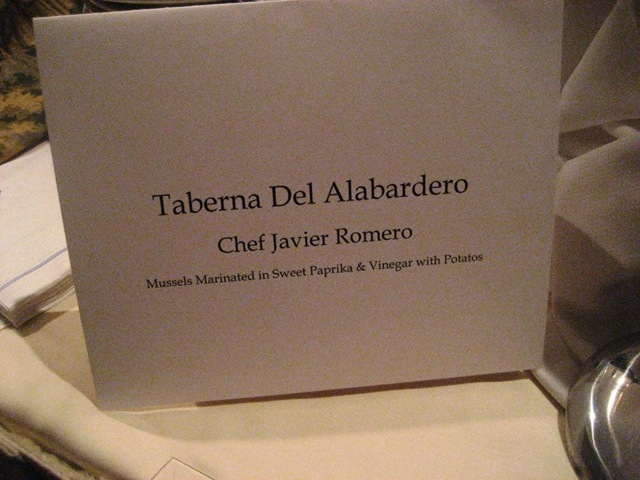 Another highlight was from Taberna Del Alabardero. These mussels were marinated in sweet paprika and vinegar in a sauce with a touch of cream and potato sticks (I’m sure they had a fancier name for them) on top. 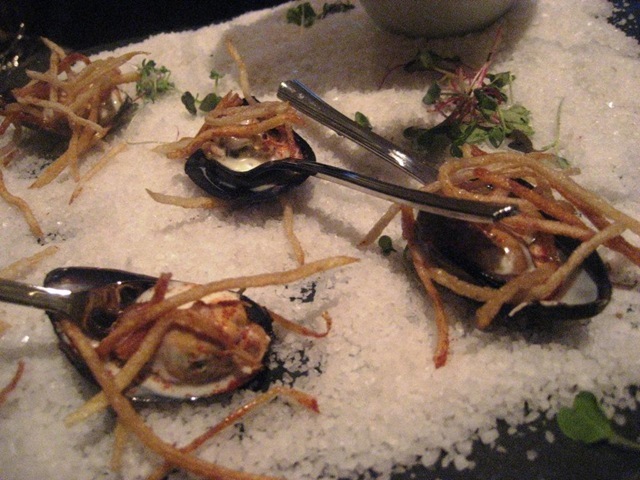 The crunch of the potato against the warm mussel and the creamy sauce was just perfect. 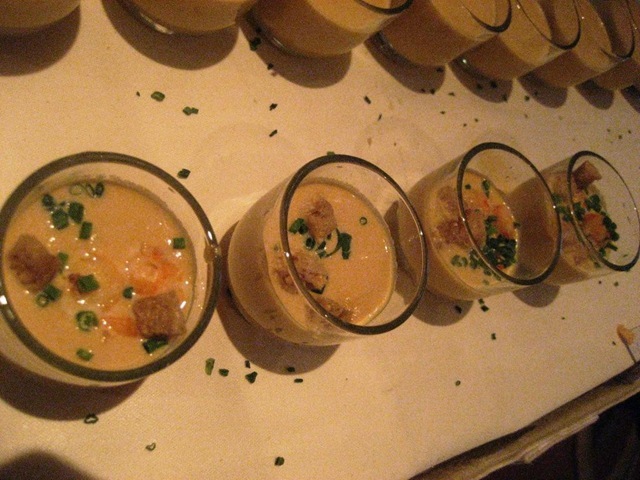 Lobster bisque? Why yes, yes I will. 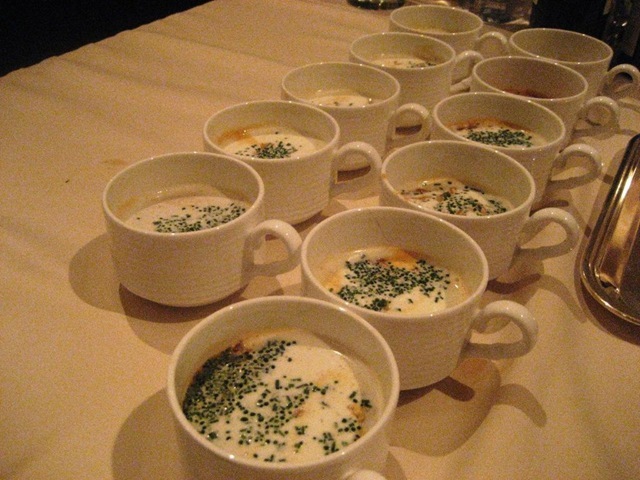 Chunks of fresh lobster burst with flavor in the creamy broth. 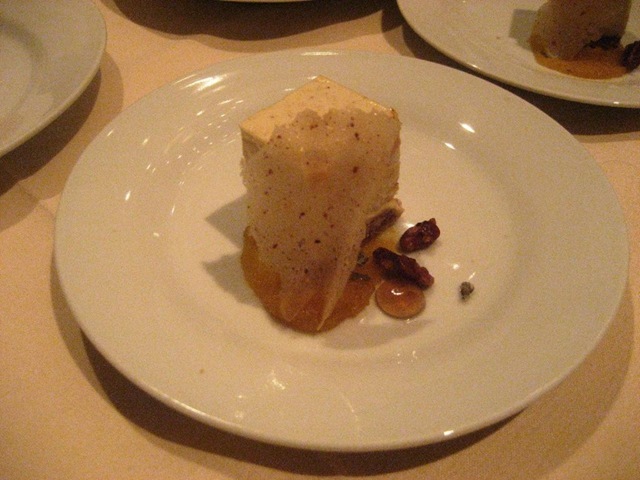 I think they served it in a cup so you could literally drink it down and somehow I resisted licking the cup clean..
Butternut squash gelee with honey and toasted walnuts..
And as if I hadn’t had enough, popcorn to eat on the way home. My favorite drink of the night by far was this incredible pear cocktail. 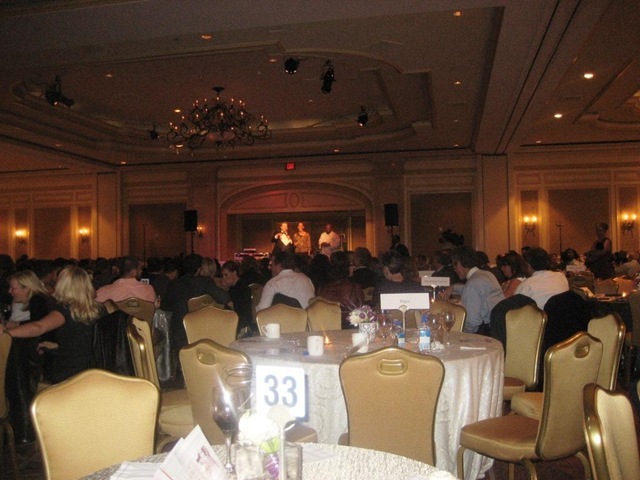 After all the food and drink tastings, everyone sat down for the live auction. Though the food and drinks were unreal and I had some of the best things I’d ever tasted in my life last night, my favorite part was when Joshua Hoffman, the 2010 national ambassador for March of Dimes, got up on stage before the silent auction began and gave a speech. Joshua was born at 23 weeks (just like my nephews) and is now a healthy, active, and happy 7 year old (almost 8!). He talked about how March of Dimes saved his life and his dream is for one day all babies to be born healthy like his little brother was. “The March of Dimes saved my life, and now I want to fight for preemies and reach for the stars.” His speech was so moving and literally left tears in my eyes and much hope in my heart for my nephew. I was so happy to be at an event where all the proceeds go to such an amazing cause. You can check out more about his story here. 1.) I found out today that I got selected to be an Official POM Party Host! 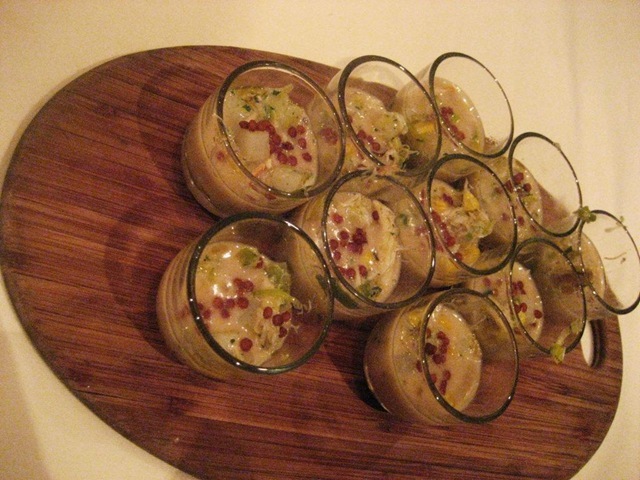 You can check out details here, but basically Foodbuzz sent an email about applying to be a party host a few weeks ago and I sent in some ideas about courses with pomegranates, and they notified me today that I got selected! This means that they will send me two packages of pomegranates, gift bags for party attendees, and some other cool POM Swag which I will obviously share with you all as soon as I get it! I’ll be hosting a dinner party during the week of November 8-14, and get to showcase pomegranates and be eligible for some incredible prizes if they pick my party as one of the top ones! 2.) I also found out today that I get to cover an event tonight on behalf of Foodbuzz! 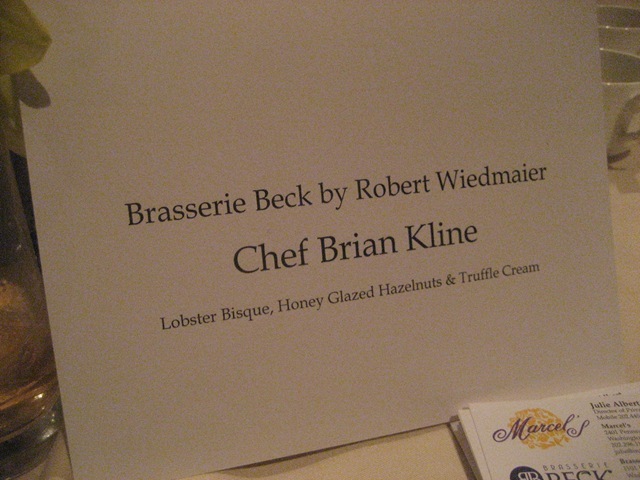 It’s the Signature Chefs Auction of DC and it’s actually tonight! Ahh! I am excited because the event supports the March of Dimes, which is a cause near and dear to my heart since they do a ton of preemie research and my two nephews were born 17 weeks premature. 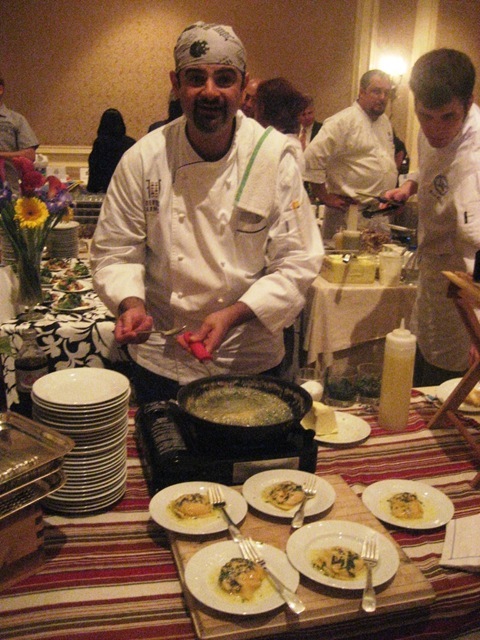 The event will feature 20 of the top DC area chefs with tastings, as well as both a silent and live auction. It should be fun! Just a quick lunch post because I gotta get cracking on plans for the event tonight and wrap up with work! Wil went fishing yesterday on a chartered boat off of Maryland and caught two large rockfish. The company that charters the boats actually filets the fish for you once you get on shore, so he came home with a HUGE back of fresh as could be fish that he caught himself yesterday! 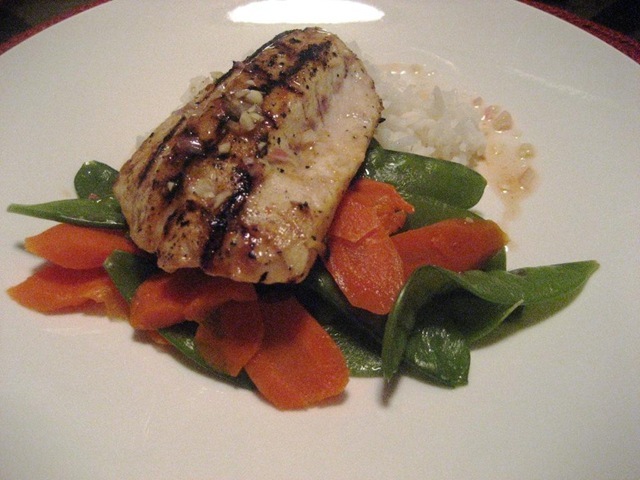 He made us an awesome dinner last night of grilled fish with white rice, veggies, and an incredible sauce. Sometimes simple is best when the ingredients are as fresh as this. The sauce had red chili paste, oil, shallots, garlic, salt, pepper, and some citrus. 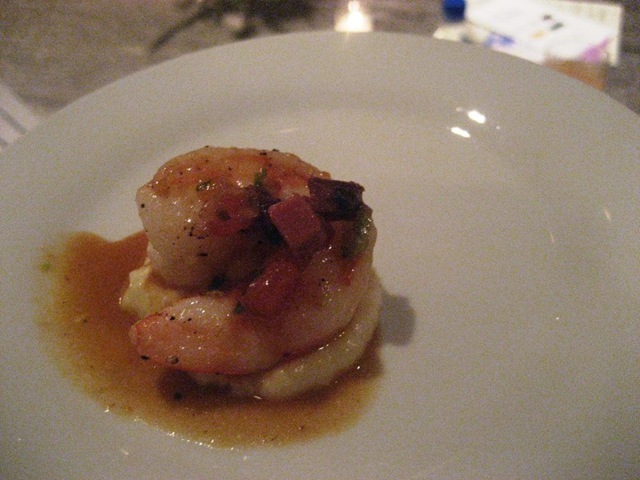 It was seriously out of this world and the fish was so melt-in-your-mouth fresh that I did NOT want the plate to end. But, end it did. Luckily there were extras for lunch today! What better way to use leftovers then to throw them all on top of greens and call it a salad? 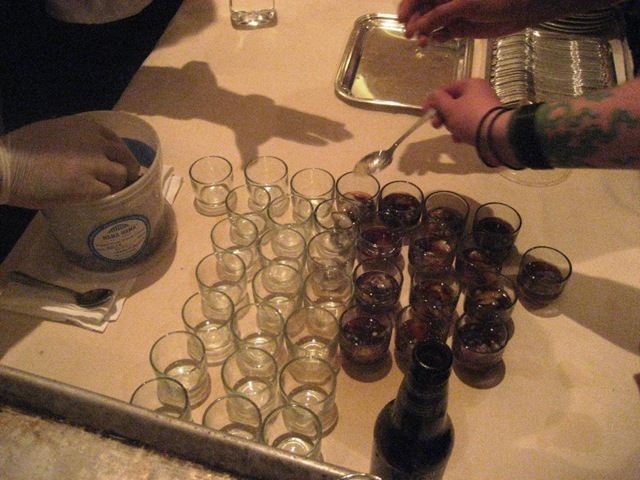 Have you ever been to a tasting event like what I’m attending tonight? I never have and cannot WAIT! Do you have any cool suggestions for cooking or DECORATING with pomegranates? 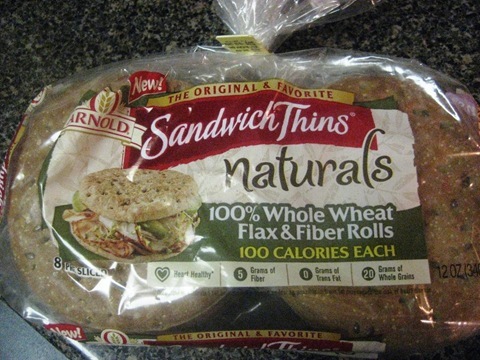 I spotted a new product last night at the grocery store – Arnold Sandwich Thin Naturals – Flax and Fiber. I totally got sucked in by the marketing because I read “natural” and assumed the ingredient list would be shorter (without looking). Unfortunately there are a few things on there I don’t love (and I should probably check these things before buying) but I was excited to see a new variety anyhow. Breakfast today was Loaded Toast, but reworked a bit. And it was GOOD. I loved cutting these up so it felt like I had so much more than I did – the mind plays some crazy tricks on ya. Workout at least 4 times (including at least 1 run) – I did yoga Tuesday, swam Wednesday, biked Thursday, and yoga again yesterday morning, but no run. I get a half check on this because though I did technically work out 4 times, I only got two really good workouts in – the bike ride and the swimming. I like to get my heart pumping! Drink more water (at least two 32 oz bottles at work per day) – Check on this one! I got some great tips and have started adding a little apple cider to my water each day, and also purchased a new water bottle that should be arriving on Thursday. I’ve had at least two full bottles of water at my desk every day since starting this goal. Start each day with a healthy breakfast. Check! I’ve done a good job with this one and starting my day with a healthy breakfast helps keep me on track throughout the day. 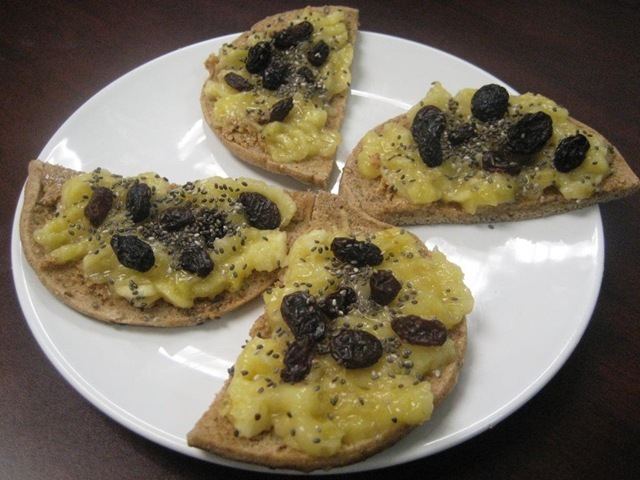 Plan one treat at least per day (to keep me on track – hello vitatops!) – Check! Though I didn’t have a VitaTop once, I did have a few other treats (mostly after dinner) – and having them to look forward to definitely helped me stay on track. 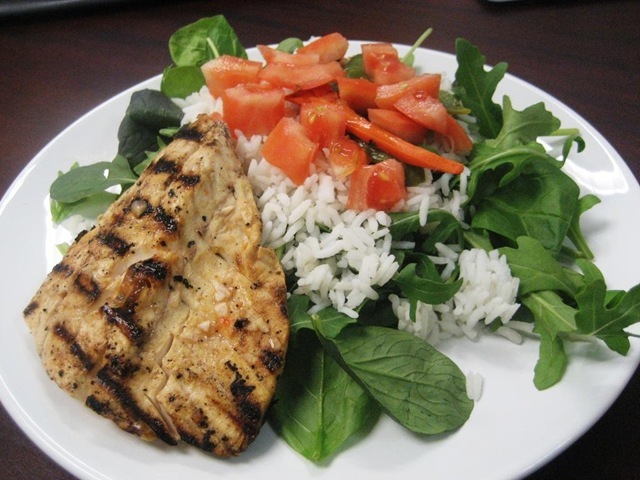 Cook healthy meals at home. Check! I cooked at home almost every meal except for Friday night and eating out on Sunday after church/Chuck E. Cheese. 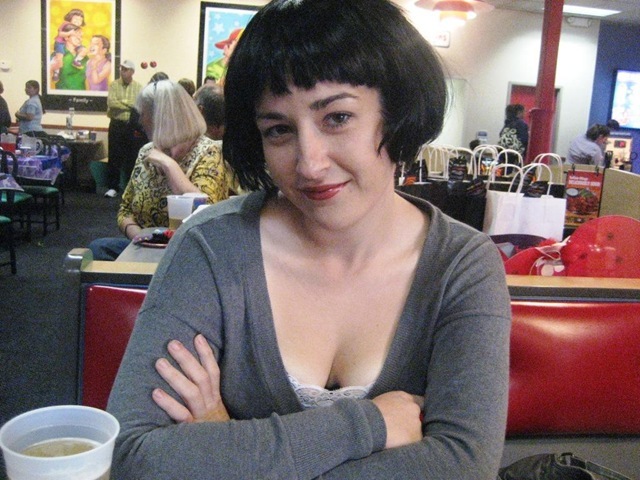 Friday night will be my splurge night for dinner for a friend’s birthday, but other than that no drinking this week. Check! I did have one glass of wine on Saturday with my friend Jess’s parents, but other than that I didn’t have a drink at all other than Friday night. Woohoo! Start Meal Planning most dinners during the week. This will help get me more excited about cooking at home and help with the budget. No more grocery shopping until next Tuesday (earliest). I like it a little too much. Workout over the weekend at least once. Zero clothes shopping this week. I like that a little too much, too. What about you? Did you accomplish what you set out to this week? I am finding setting weekly goals to work really well, it just can be tough to stay on top of. But, especially with the impending holidays, I really want to try to set realistic goals through the end of the year, but we’ll see how that goes. 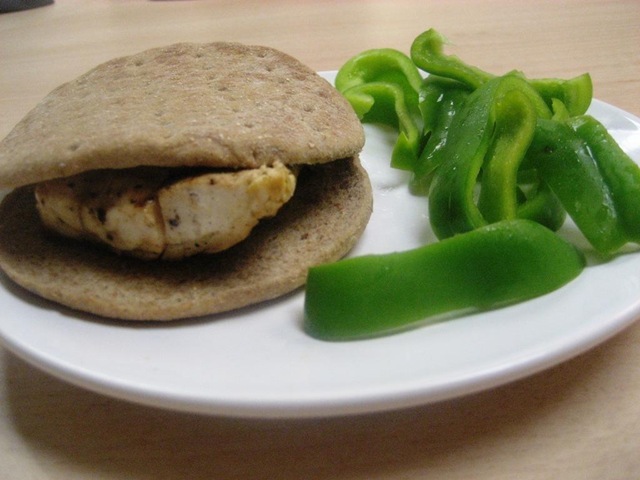 Also, what are some easy lunches you’ve been making lately? Looking for ideas. Is There a Trick? An Adora Giveaway! Happy Monday afternoon! Just a quick lunch post, and then another giveaway for one lucky reader! I was craving vegetables when I woke up because I didn’t really have too many this weekend (unless the veggies on the Chuck E. Cheese pizza count? 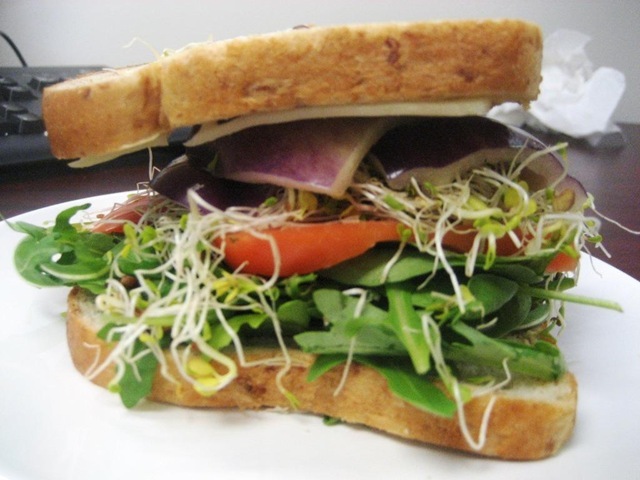 ), so I went with a huge veggie sandwich and a massaged kale salad. SO good. And SO tall! For the massaged kale salad, I ripped some kale off the stems and washed and dried it thoroughly, and then rubbed (literally, with my hands) 1 tsp of olive oil and some salt into the kale. I added some chickpeas (for extra protein) and gorgonzola (because I love cheese) and it was awesome. And now, for another giveaway! 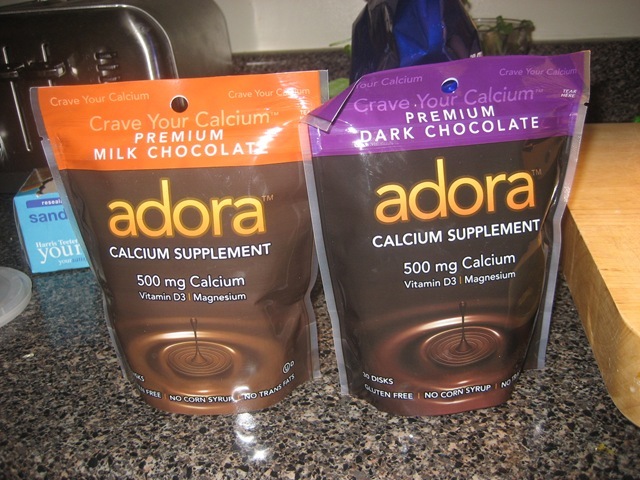 The folks over at Adora sent me two packages of their chocolate calcium supplements to review. 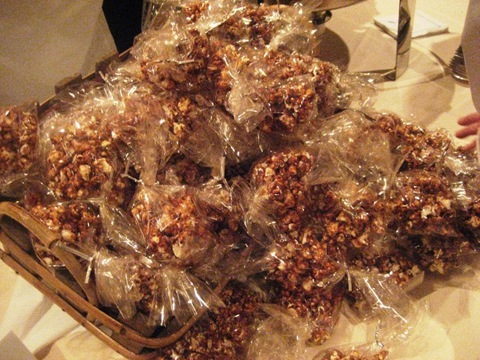 We were given some of these at the Healthy Living Summit back in August and they are SO good. I gave two to Wil and after he ate them I told him they were calcium supplements and he asked if there was a trick because they taste so good! One lucky reader will receive two bags of the supplements – one dark and one milk chocolate. They taste so good you won’t even believe they are supplements! Leave a comment on this post telling me whether you prefer dark or milk chocolate. Tell me how you would use these besides just eating them straight up! Join Beth Journey to Thin’s facebook page and leave a comment telling me you did. Post about this giveaway on your blog (if you have one!) and link back to this post. You can enter now through Thursday evening, and I will pick a random winner Friday morning. Good luck! This weekend was amazing. It was so nice to stay put and have time to relax! Friday after work I met up with some friends for drinks, and then went to see Louis CK (a comedian) at the Warner Theater. Wil got free tickets to the show and sad story, they did not allow any photos inside, but let me assure you, he was HYSTERICAL. That was actually my first time ever seeing live comedy which is shocking because I love watching it on TV – and it was just awesome. love love love. Saturday I made a nice little breakfast for Wil and I. 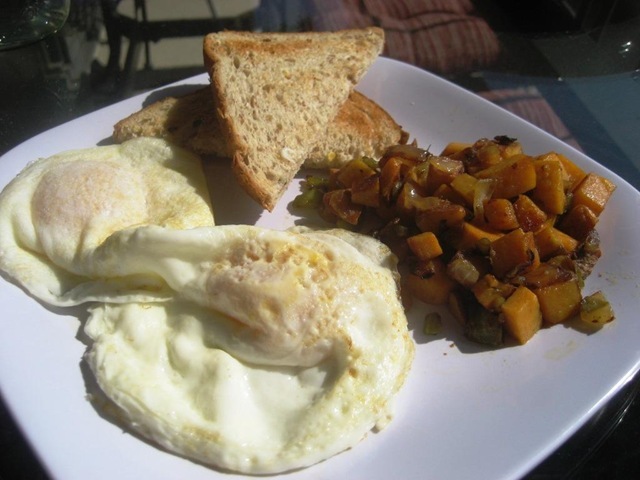 Sweet Potato Hash with eggs and toast. My newest secret for sweet potato hash is that I chop up the potatoes and then put them in water in the microwave for 3-5 minutes before adding them to the pan with peppers and onions. It speeds up the process SO much and make it only take about 10 minutes, rather than 25-30 if you don’t pre-cook the taters. 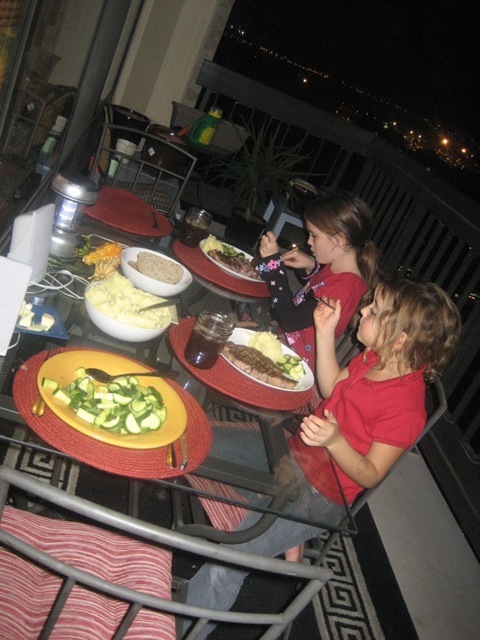 Eaten outside on the balcony = perfection. Shopping, church, and wigs filled up the rest of my weekend. Oh, and Chuck E. Cheese. For real. Did you know they now have beer and wine (that comes out of the wall – scary) there? I think it’s so parents can tolerate taking their children there and not want to leave before they sit down. It made it MUCH more tolerable. Then, this morning, I woke up early for free outdoor yoga! I only got to do this one other time even though it is pretty much right outside my apartment. Just when 6:45 on Monday rolls around, my bed is so much more temping that getting up. But today was the last day, and they happened to be giving out free fleeces to the first few people to arrive, plus yoga mat bags. You best believe I was literally the first person there (I got there at 6:45) and sat outside by myself in the dark for 10-15 minutes before anyone else came. But, i got one of three free fleeces, so it was totally worth it. 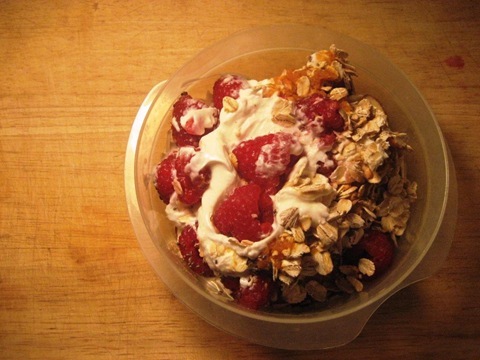 After yoga, which was mostly stretching and didn’t cause me to break a sweat at all, I went back inside to get ready for work and throw together an amazing yogurt bowl – best one in a while. 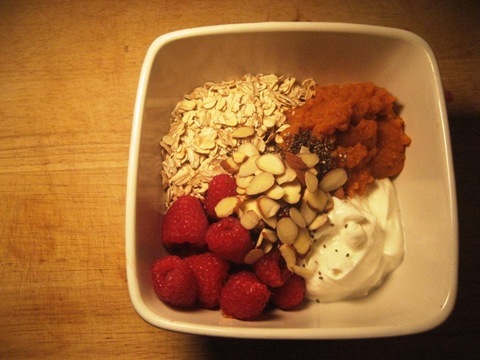 Nonfat Greek Yogurt, Canned Pumpkin, Rolled Oats, Raspberries, Chia Seeds, and Sliced Almonds. I toyed with the idea of adding the last of that amazing granola and some nut butter, but I decided this was enough. Funny because after I put together this beautiful bowl, I decided I wasn’t hungry enough to eat it yet, so I transported it sloppily into a tupperware for transport. Come back after lunch for another exciting giveaway! Last night I went to the Farmer’s Market after work. I was really excited to go to the FM and pick out what I wanted, since I hadn’t been in so long since I’d been getting my CSA. But now that that’s over, I got to go and browse. I ended up getting some random things, but am pretty excited about my purchases. 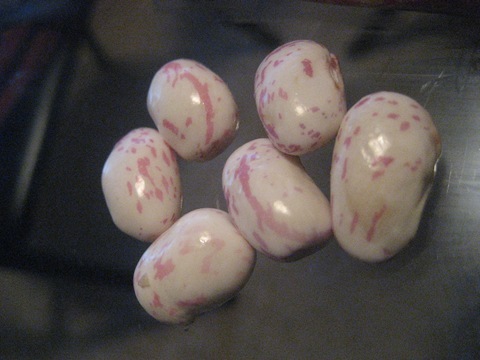 I had never seen the Bird Egg Beans before and they are SO pretty. 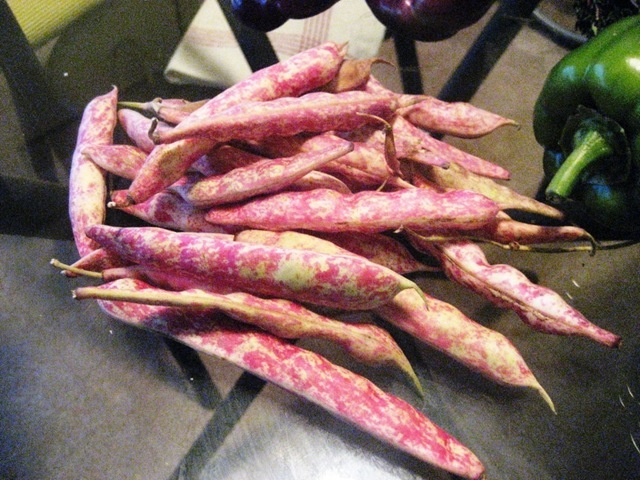 The beans are slightly less colorful on the inside, and are speckled just like birds eggs… thus the name. Not sure what I’m going to do with those yet, but aren’t they pretty!? And the oysters – that was sort of an impulse buy because there is a fish stand at the FM which I really appreciate (many just have meat stands and no seafood) and I’ve never bought anything from there before. I was talking with the people running the stand and the man had just caught the oysters yesterday. It was $8 for a bag of 12, and because I have a chef boyfriend who knows how to shuck oysters, I took the plunge. 🙂 Wil did suggest putting them in the oven until they just pop and then opening them so they are slightly warm and then you don’t have to mess with shucking them. It’s funny because after I got home and I realized I wasn’t really paying attention to how much I was spending, so I decided to count it up. Guess how much I spent? $26. The exact price of my weekly farm share, with more, better looking goods. This morning I took the other serving of Heat-N-Eat Steel Cut Oats from yesterday and added 1/4 cup of low fat cottage cheese (8 grams of protein!!) and 1/2 cup of canned pumpkin. I heated it up for about 2 minutes in the microwave and topped it with some of that mind blowing granola. 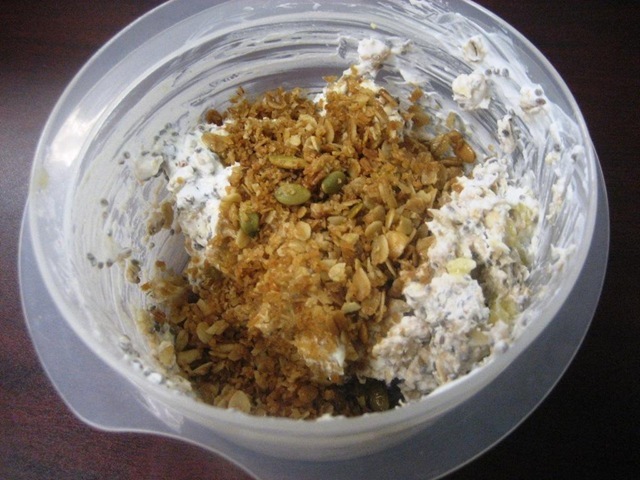 The cottage cheese melted right into the oats and made it creamy and smooth. This is the first time I’ve ever added cottage cheese to my oats and it is SO good. 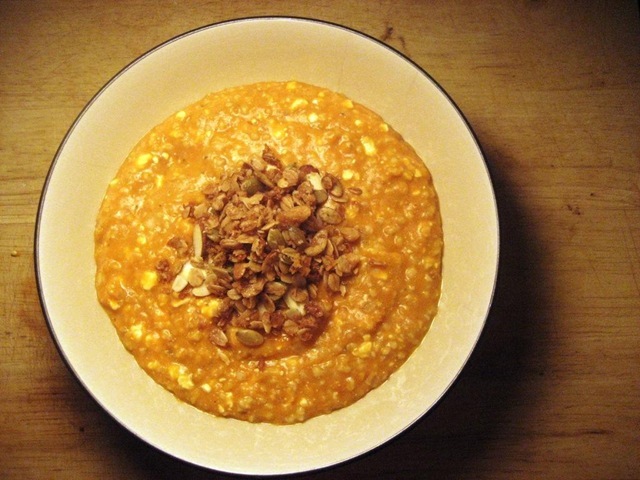 This whole bowl (minus the toppings) has only 3 points on WW – 2 for the oats, 1 for the cottage cheese, and 0 for the pumpkin, and is packed with fiber, protein, and whole grains. I will DEFINITELY be using cottage cheese in my oats again. You can barely taste it – it just makes the texture unreal and the meal more stick to your ribs! 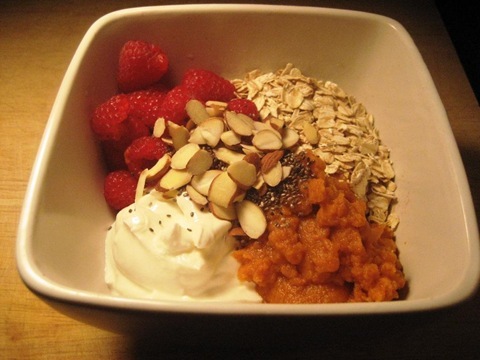 What’s the weirdest thing you’ve ever put in your oats? Did you like it? What is the most unique thing you’ve ever purchased at a farmer’s market or grocery store? Thank you all so much for the feedback on yesterday’s post about Choking Down Water. There are some great suggestions in the comments section, a few of which I have already put to use! Gabrielle @ Weightless said “Lately I’ve been adding a splash of apple cider; it makes me feel like fall without all the calories!” There is some apple cider in my fridge at work leftover from a work party last week, so I’ve been adding just a touch to my water bottle and its made SUCH a difference! It feels so seasonal, too. Lunch today took less than 10 minutes to get together, and was SO good. I took a Quorn Naked Chk’n Cutlet and doused it in Frank’s Red Hot and then left it in a tupperware in the fridge over night. 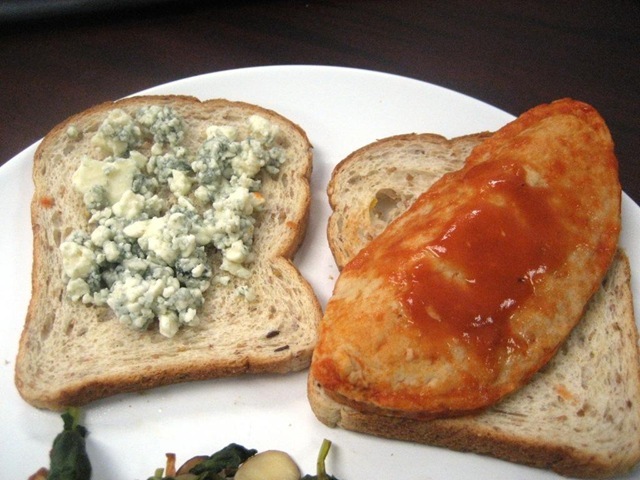 Today I toasted two slices of bread, heated the chicken for 30 seconds in the microwave, and topped it with some blue cheese crumbles. This was awesome. The Quorn Chk’n Culets taste almost scarily exactly like real chicken. 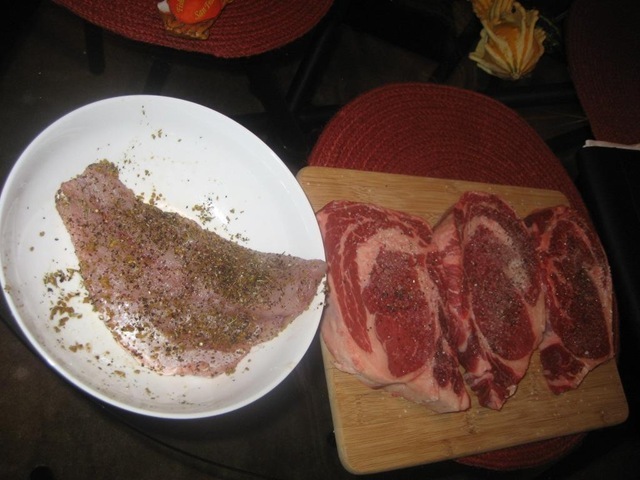 If you’re a vegetarian who actually doesn’t like meat – I wouldn’t recommend these. But if you’re like me and don’t mind the taste/texture of meat or are a meat eater looking for a low cal substitute for chicken, these things are awesome. The whole cutlet has 80 calories, 2.5 grams of fat, 2 grams of fiber, and 11 grams of protein (aka 1 WW point). Doused in the Frank’s Red Hot it tasted exactly like a buffalo chicken sandwich. 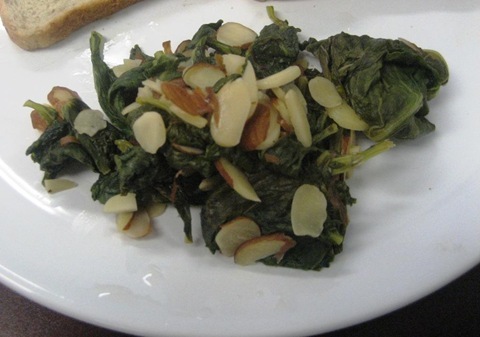 On the side, I sauteed some mustard greens (last from my CSA) in some white wine, salt, pepper, and then threw in a small handful of sliced almonds. 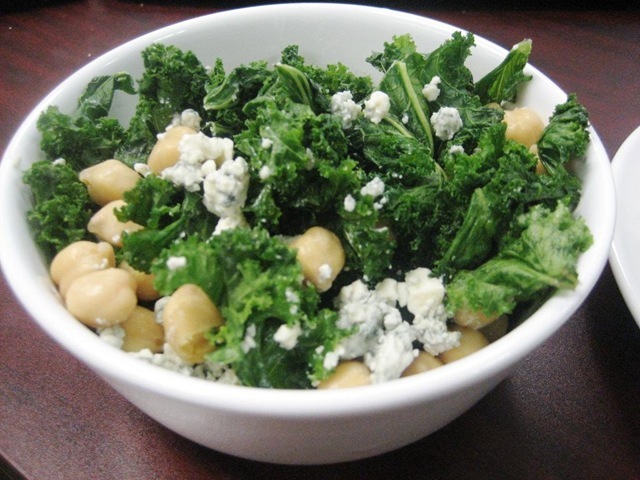 The almonds in there added a nice crunch and texture to the greens. I’ve had many people ask me how hard it is to use up all the veggies from my CSA (which is over by the way!) To be honest, there were a few weeks where I’d get the same things over and over and have to figure out creative ways to use them (like corn). 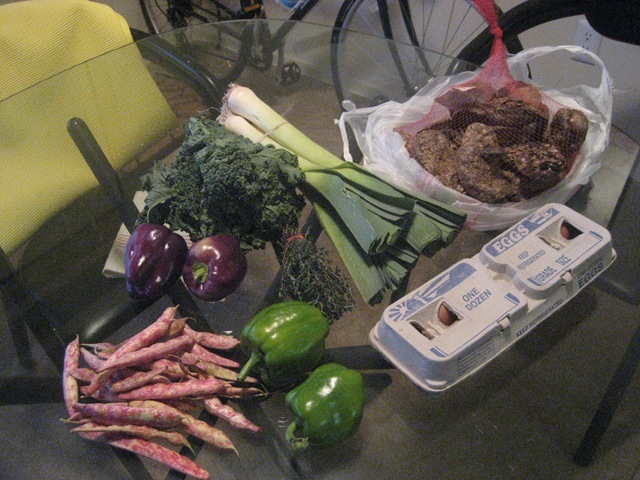 For the most part though, my CSA only had 5-6 different things, and I eat a LOT of vegetables. Especially when I would get greens throughout the season, they cook down so much that you can use the whole bunch for 1-2 servings. I think if you don’t eat that much produce it would be hard to use up, but I (as you can see!) eat lots and lots. In fact, currently I only have beets, a head of cabbage, and a few apples left from my CSA for the whole season. I had to throw out 1-2 pattypan squash because they went bad before I could use them, but other than that, I used them up pretty easily. On the agenda for tonight is to hit up the farmer’s market after work, work out, and then make dinner. I lead a very exciting life, I know. How many servings of fruits/veggies would you say you eat a day? Do you think you’d have trouble eating up all the fruit/veggies from a CSA or could you handle it no problem?